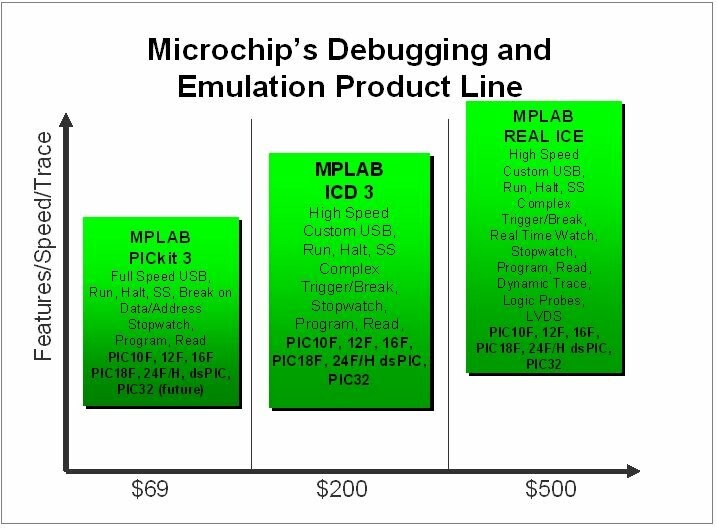 MPLAB ICD 3 In-Circuit Debugger System is Microchip's most cost effective high-speed hardware debugger/programmer for Microchip Flash Digital Signal Controller (DSC) and microcontroller (MCU) devices. It debugs and programs PIC® Flash microcontrollers and dsPIC® DSCs with the powerful, yet easy-to-use graphical user interface of MPLAB Integrated Development Environment (IDE). 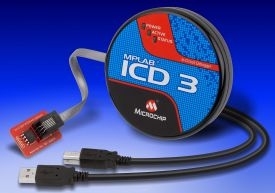 The MPLAB ICD 3 In-Circuit Debugger probe is connected to the design engineer's PC using a high-speed USB 2.0 interface and is connected to the target with a connector compatible with the MPLAB ICD 2 or MPLAB REAL ICE systems (RJ-11). MPLAB ICD 3 supports all MPLAB ICD 2 headers. MPLAB REAL ICE In-Circuit Emulator System is Microchip’s latest generation high speed emulator for Microchip Flash DSC® and MCU devices. It debugs and programs PIC® and dsPIC® microcontrollers with the easy-to-use but powerful graphical user interface of the MPLAB Integrated Development Environment (IDE), included with each kit. The MPLAB REAL ICE probe is connected to the design engineer's PC using a high-speed USB 2.0 interface and is connected to the target with either a connector compatible with the popular MPLAB ICD 2 system (RJ11) or with the new high speed, noise tolerant, low voltage differential signal (LVDS) interconnection (CAT5). 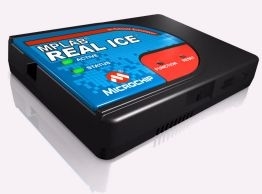 MPLAB REAL ICE is field upgradeable through firmware downloads in MPLAB IDE. In upcoming releases of MPLAB IDE, new devices will be supported, and new features added. The MPLAB PICkit 3 allows debugging and programming of PIC® and dsPIC® Flash microcontrollers at a most affordable price point using the powerful graphical user interface of the MPLAB Integrated Development Environment (IDE). 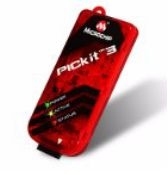 The MPLAB PICkit 3 is connected to the design engineer's PC using a full speed USB interface and can be connected to the target via an Microchip debug (RJ-11) connector (compatible with MPLAB ICD 2/ 3 and MPLAB REAL ICE). The connector uses two device I/O pins and the reset line to implement in-circuit debugging and In-Circuit Serial Programming™. MPLAB® ICD 2 is a low cost, real-time debugger and programmer for selected PIC® MCUs and dsPIC®DSCs. 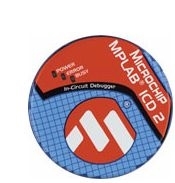 Using Microchip Technology's proprietary in-circuit debug functions, programs can be downloaded, executed in real time and examined in detail with the debug functions of the MPLAB IDE. Set watch variables and breakpoints from symbolic labels in C or assembly source code, and single step through C source lines or into assembly code. MPLAB ICD 2 can also be used as a development programmer for supported MCUs. Please consider the MPLAB ICD 3 (DV164035). 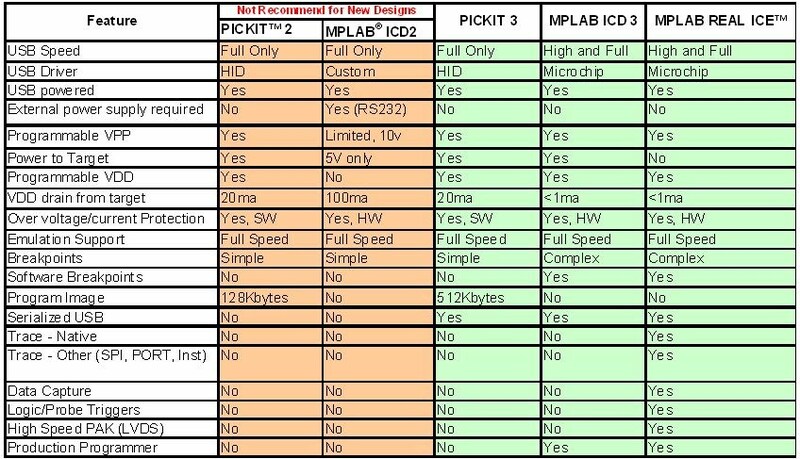 The MPLAB ICD 2 is not recommended for new designs and will not support new MCU or dsPIC devices released after September 2010. Click here for MPLAB ICD 3 info. PICkit™ 2 Debug Express and the PICkit 2 Starter Kit enable in-circuit debugging on selected PIC®microcontrollers. In-circuit debugging runs, halts and single steps the program while the PIC microcontroller is embedded in the application. When halted at a breakpoint, the file registers can be examined and modified. The PICkit 2 Debug Express includes a development board with Microchip’s 44-pin PIC16F887 Flash microcontroller. This starter kit gets you quickly up to speed developing with PIC® microcontrollers. A series of twelve lessons are provided that cover I/O, interrupts, A/D converters, data tables and timers, with an additional lesson covering debugging features. 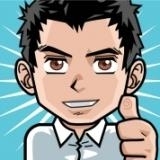 All source code for the lessons is furnished. Please consider the PICkit 3. Click here for PICkit 3 info.